Patriots and Rams fans get an extra set of colors to go with their outfit. 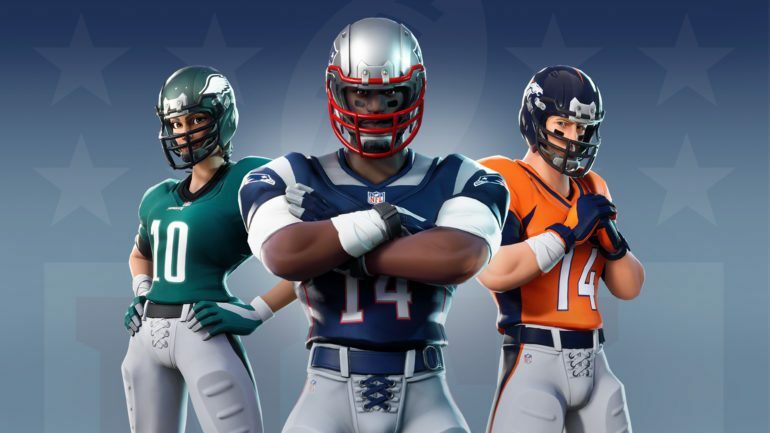 NFL uniform outfits are making their way back into Fortnite: Battle Royale to celebrate Super Bowl LIII. Starting Friday, Feb. 1 at 6pm CT, the infamous football skins can be purchased from the item shop. They’ll include two additional white Away styles for the New England Patriots and Los Angeles Rams, the two remaining teams in the NFL playoffs. The next day, a Pigskin Toy will be available for free in the item shop as well. The toy is actually just a football, and players can interact with it similar to the hockey puck, golf ball, and basketball emotes. Kickoff for this year’s Super Bowl begins on Feb. 3 at 5:30pm CT in Atlanta, Georgia, and the football skins will likely move out of the item shop around the same time.